1.25 oz. Northern Brewer Pellet 6.50 30.8 60 min. 1.00 oz. Northern Brewer Pellet 6.50 6.6 15 min. 1.50 oz. Cascade Pellet 6.00 6.8 10 min. 1.50 oz. Cascade Pellet 6.00 0.0 0 min. Mashed in at 154*F or 68*C if you will. As I am a BIAB brewer I've made some slight adjustments i.e took into account no sparging. This is my first attempt on the electric water urn brew kettle my friends and I chipped in to buy and brew day is off to a bad start. With a beer this big you need a lot of grains and alot of water. This is probably one of the biggest problems with BIAB brewing. Let me explain. So to start I need 23L + 7.5L + 3L which gives me 33.5L of water needed. 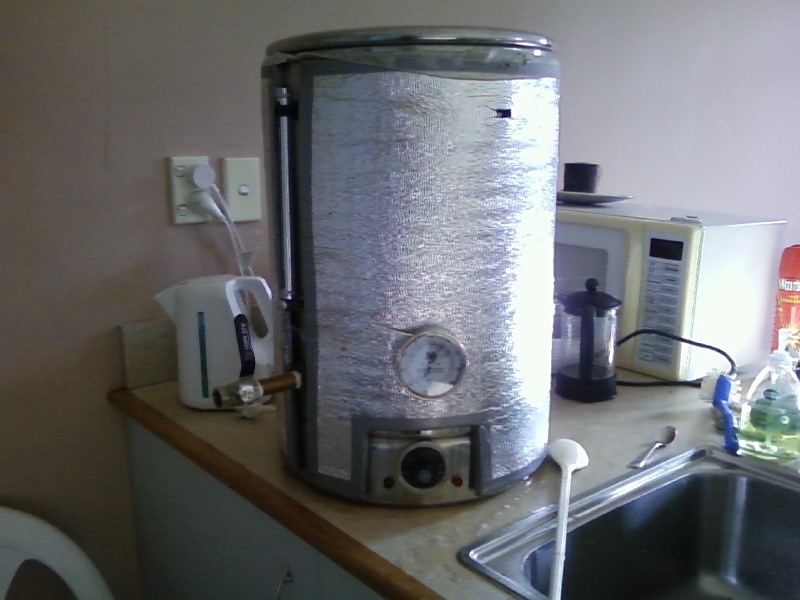 Plenty of room in a 40L kettle for that. Except i haven't eally taken into account the displacement of the 7.5kg og grains. Now 40L isn't quite big enough and I got a bit of an overflow. Still, rather be doing this than working.